So old school heads complain that hip hop isn't political anymore, by which they mean there aren't as many didactic calls for revolution. I'd argue that the records cats like Elucid and Kemba are making are political--just more personal, more exploratory, more complex. They're drawing on wider influences than slogans and fighting powers more insidious, more entrenched, internal as well as external. If race, and discrimination based on race, is ever going to be eliminated it has to be treated for what it is: a social construct. We need to hear wider narratives than guns and butta. So the more subjective experience, complexity and nuance are explored, that's pushing beyond race a lot more than hashtag activism. And the furthest beyonds are space and the future. I mean, even W.E.B. DuBois wrote science fiction. 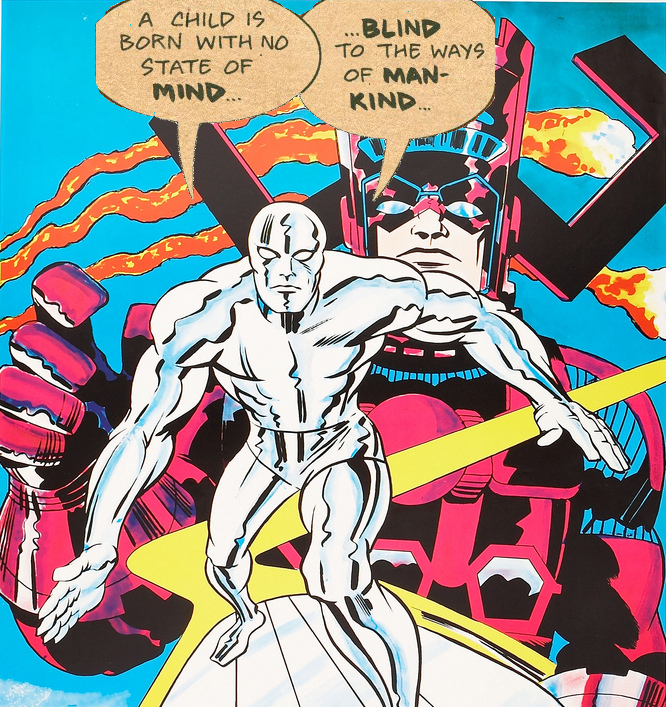 The Silver Surfer, in case you're not a nerd or don't have kids who read comics, was like the Invisible Man with the power cosmic, reflective (literally and emotionally) instead of transparent. You could write a dumb Master's thesis on Galactus, The World Eater, The Cosmic Hunger, as Space Whiteness (and The Watcher as Space White Liberal) and the Surfer as an afrofuturist slave narrative, but hey let's not (especially because you have to twist up a connection with surfing and there ain't enough lentils in all of grad school for that). Let's put it in afrofuturism instead as another new cosmology, like Farrakhan's Mothership Connection. But no doubt Galactus is about holocausts, genocides, the total erasure of civilisations. And the Surfer is the sole survivor, who's also morally compromised by what he's done to try and save his people. And loses everything. When Galactus rolled up on his planet to eat it, the Surfer gave himself up to save it, but after years? Centuries? of servitude, he turns on his master and for this rebellion is exiled. He never finds his way home. That's the feeling imbued in the joints in this mix--they're not necessarily about flying saucers, but they have a celestial heft, whether it's raging against the planet-eating machine or the loneliness of the galactically disenfranchised. They're shooting bars like energy beams all up in Galactus' Kirby-purple grill. There's a superstring of the cosmic in rap's legacy, with seeds from Sun Ra, the Black Ark and P-Funk mythology...from 'Whitey On The Moon' to 'Planet Rock,' 'Space Rap' and 'Space Is The Place' to the O.G. (Original Galactic) Rammellzee, to Kool Keith to Divine Styler to Deltron to Killah Priest and even Killarmy--remember 'Galactics'?--through to Binary Star, Cannibal Ox, Shabazz Palaces, Cudi and on and on, you don't stop. An ever-expanding universe. There's always been that reaching for something up from the gutter, beyond the dirty streets, something higher, the strength within infused with power from beyond. Something above the clouds. These songs from 2016 reflect the power cosmic, the soulfulness and loss of traveling the spaceways, the intersection of Sun Ra and The Message.